It’s hard to tell from the picture but the grilled in this Greek salad actually comes from the romaine. Grilling lettuce sounds like every carnivore’s nightmare but it’s easy to do and makes your lettuce juicy and smoky. Just slice straight through a head of romaine leaving the core intact. Brush both cut sides with olive oil, sprinkle with salt and pepper and flop, cut side down onto a hot grill until the lettuce begins to singe and wilt. I turn off the heat at this point, flip the romaine so that each half’s outer leaves are now touching the grill and leave to cool/cook while I prep. 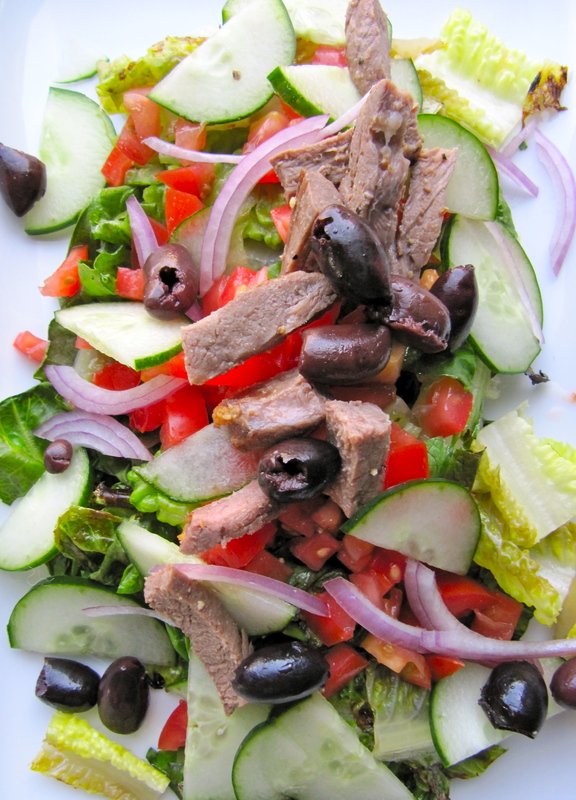 The rest of the ingredients are your typical Greek salad fare: Kalamata olives, thinly sliced red onion, and diced tomatoes. The tomatoes are out of season but can be pepped up with a little red wine vinegar, salt, and pepper and allowed to rest. The meat is broiled goat steaks but chickpeas would be an excellent meat-free alternative. For the dressing (not shown) I used David Lebovitz’s Creamy Feta and Red Wine Vinegar Dressing. I really like the idea of adding the cheese to the dressing. It gets more evenly distributed on the salad and with a fairly assertive cheese like feta it’s broken down into more manageable punches of flavor. I might have to try substituting some of the water for Greek yogurt next time to make the dressing even thicker and tangier. All in all an excellent meal and a gentle coax into the summer season of dinner salads. 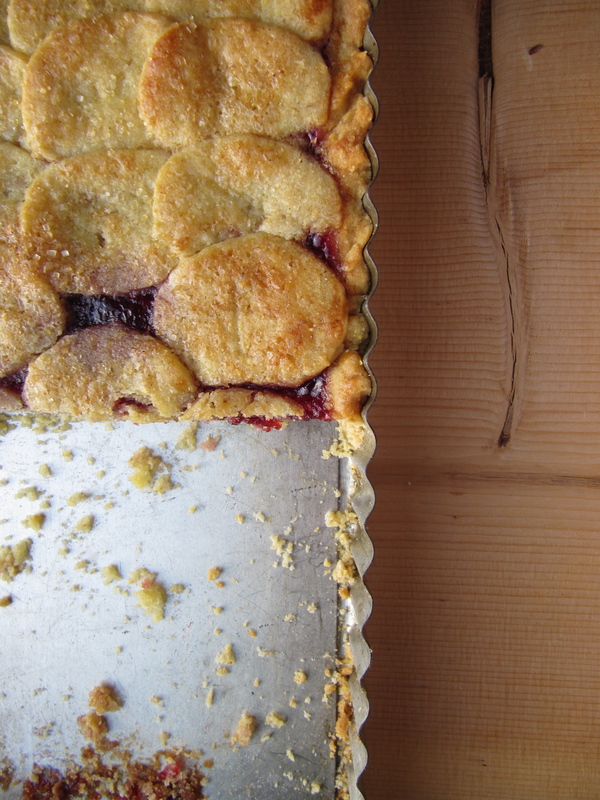 I love this little tart from David Lebovitz’s book Room for Dessert in so many ways. Where to begin? First, the crust is pressed into the pan versus the trickier rolled crust. Second, this tart works just as well for using up those jars in your fridge with just a smidge of jam left as it does for spotlighting that special jar of jam, the one you’ve been saving and hiding from your husband. Third, the overlapping circles of dough on top are a cinch. This recipe makes tarts fun and carefree. And finally, it’s immensely adaptable depending on your pantry and preferences. I thought I would like it jammier but I think Smitten Kitchen’s measurements are more to my liking. 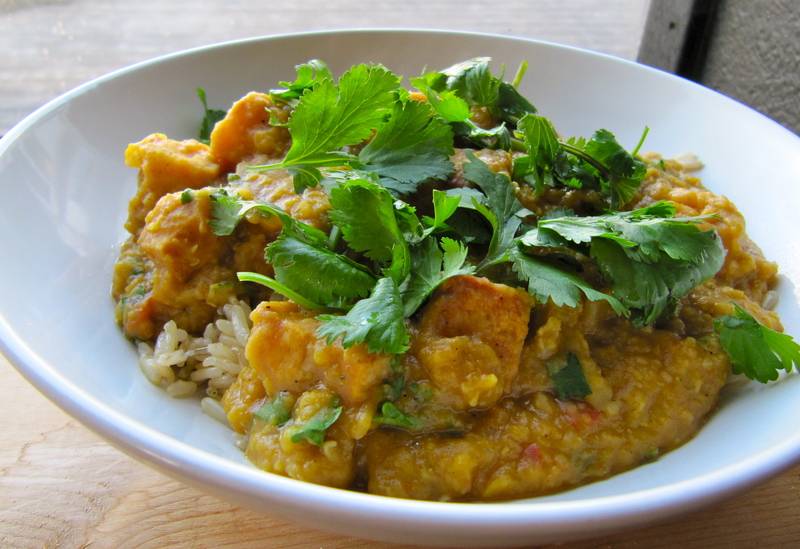 I’ve been on an Indian kick since our trip to England and I’ve added a few go-to recipes to my repertoire. Even better, you can make the bases ahead of time, pop them in the freezer and defrost for a lazy Monday dinner. Curry Base Sauce An hour simmering on the stove and you’ve got three containers of sauce for three different dinners. Pictured: the chicken pathia from the same blog. I skipped the red coloring (ew!) and used just one chicken breast. I also used the sauce with shrimp using this recipe as a starting point I sauteed a sliced onion, two chilies and the shrimp then added the curry base. And finally, vegetable curry. In my Indian food frenzy I bought about two pounds of red lentils at the co-op, then found an even better deal online (yeah prime shipping!) and decided I should buy some more. So, I have about 8 pounds of red lentils in my cupboard now. 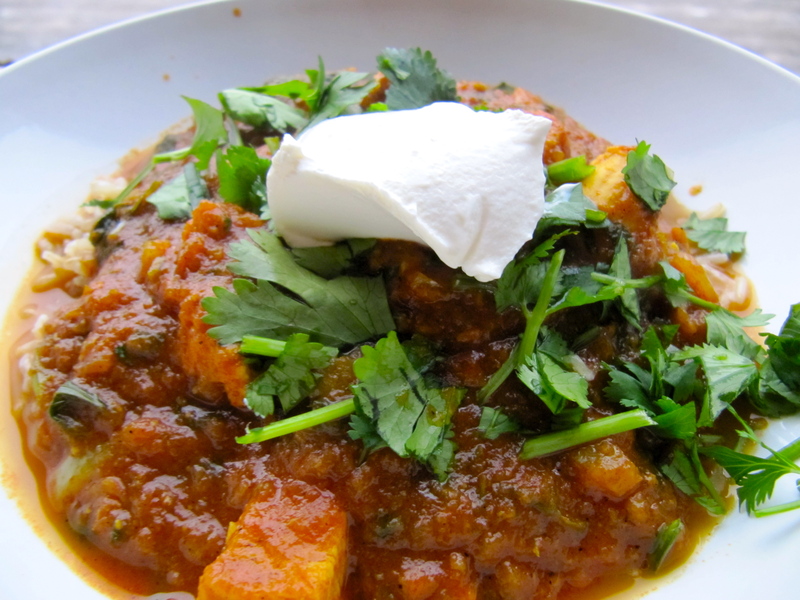 Good thing this garlicky red lentil dal is so good and freezes well. I added some fried tofu. It also makes a good dip if you simmer it until thick. I tend to gripe about Daylight Savings Time on Sunday when I’ve lost a precious hour of my weekend (why can’t we spring ahead Monday afternoon at about 3:59?) but this year the time change has coincided with a shift in the weather. Not only does spring finally feel like it has arrived but after work with the sun streaming into the kitchen and the deck door open, summer doesn’t seem that far off either. I can actually finish making dinner before the sun goes down which means food photos don’t have that depressing artificial light pallor to them. Hurray for spring and to celebrate, recipes of course. Neither of these recipes are mine and I’m afraid they might not be terribly authentic but they were delicious nonetheless. The soup is an old “keeper” and the focaccia was a first try from the night before crisped up in the oven for round two. I’ve been on a bread baking kick once again and I’m finding new variations on the no knead method. 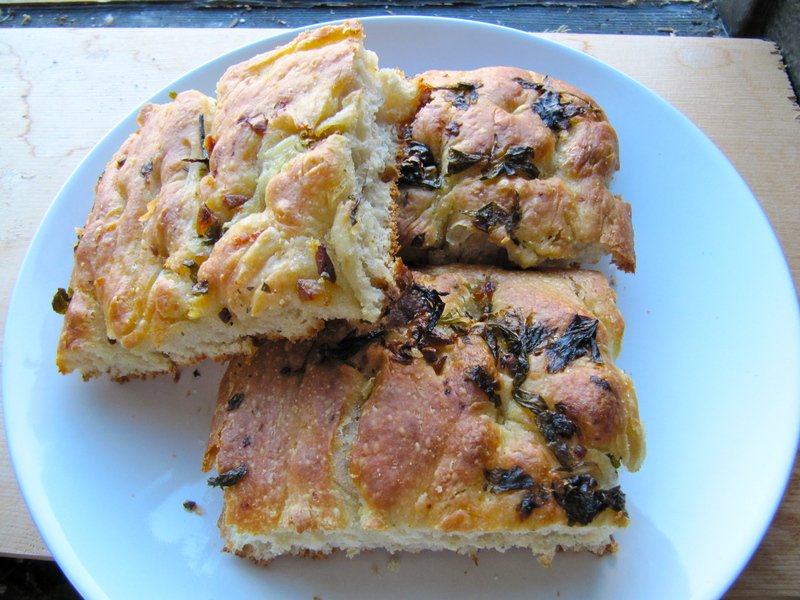 This no knead focaccia turned out well and with all the ingredients in hand it was a snap to put together. I used pan roasted garlic, chopped parsley, kosher salt and olive oil for the top. 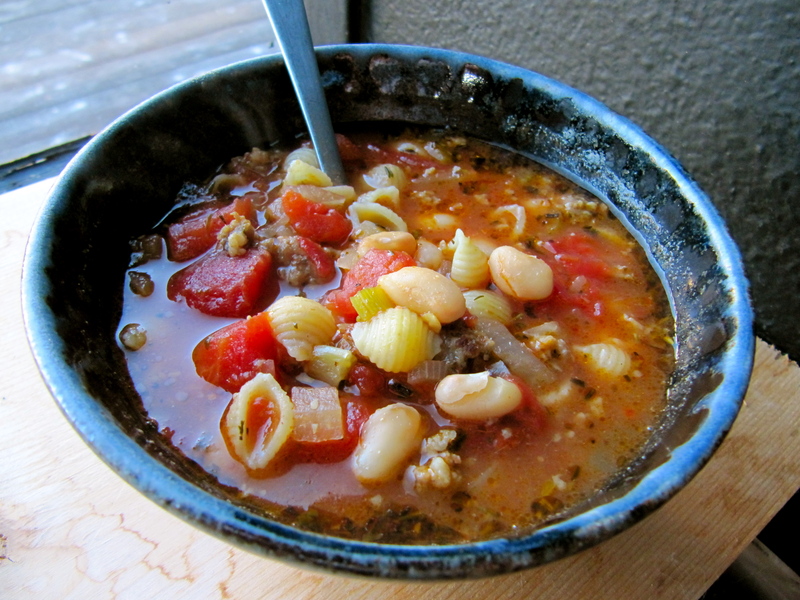 Pasta e fagioli I tweak this recipe a bit by using just 1/2 a pound spicy breakfast turkey sausage, a 28 oz can of diced tomatoes and small shell pasta because I can never find ditalini. Focaccia I love foreign recipes because they include weight measurements for baking which is really much easier (and kitchen scales aren’t expensive but are immensely handy) but here is the recipe on another blog with lots of pictures (and lots of scrolling). Phew, October and the VeganMofo challenge are over. Daylight savings time is too and I think it’s time to hibernate. Back to the blog in a few weeks.